The Savannah River Basin incorporates 35 watersheds and some 2.9 million acres within South Carolina (portions of the basin are located in North Carolina and Georgia). 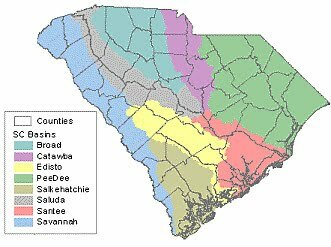 The Savannah River Basin is divided into three regions: the Tugaloo/Seneca, the Upper Savannah and the Lower Savannah. The basin provides South Carolina, Georgia and parts of North Carolina with recreation, wildlife habitat, energy, drinking water and economic resources. The Savannah River Basin is a vital resource to the communities along its reach and within surrounding areas. Learn more about the Savannah River. The Savannah River is a major river in the southeastern United States, forming most of the border between the states of South Carolina and Georgia. Two tributaries of the Savannah, the Tugaloo River and the Chattooga River, form the northernmost part of the border. The Savannah River drainage basin extends into the southeastern side of the Appalachian Mountains just inside North Carolina, bounded by the Eastern Continental Divide. The river is around 301 miles (484 km) long. It is formed by the confluence of the Tugaloo River and the Seneca River. Today this confluence is submerged beneath Lake Hartwell. The Tallulah Gorge is located on the Tallulah River, a tributary of the Tugaloo River that forms the northwest branch of the Savannah River. Two major cities are located along the Savannah River: Savannah, Georgia, and Augusta, Georgia. The Savannah River was once navigable by freight barges between Augusta, Georgia (on the Fall Line) and the Atlantic Ocean; maintenance of this channel for commercial shipping ended in 1979, and the one lock below Augusta has been deactivated. The Savannah River flows through a variety of climates and ecosystems throughout its course. It is considered an alluvial river, draining a 10,577-square-mile (27,390 km2) drainage basin and carrying large amounts of sediment to the ocean. At its headwaters in the Blue Ridge Mountains, the climate is quite temperate. The river's tributaries receive a small amount of snow-melt runoff in the winter. The majority of the river's flow through the Piedmont region is dominated by large reservoirs. Below the Fall Line, the river slows, and is surrounded by large blackwater bald cypress swamps. Numerous oxbow lakes mark the locations of old river channels, which have been moved by earthquakes and silting. Another prominent feature is the numerous large bluffs that line the river in some locations, most notably Yamacraw Bluff, the location selected to build the city of Savannah. The river becomes a large estuary at the coast, where fresh- and saltwater mix. River dredging operations to maintain the Port of Savannah have caused the estuary zone to move further upstream than its historical home. This is causing the transition of rare freshwater marshland into saltwater spartina marsh.